Here is a Real Thing that Happened: On September 14, 2015, high school freshman Ahmed Mohamed was arrested for bringing a homemade clock to school. The subsequent public outcry caught the attention of some of America’s most influential personalities. Ahmed received an invitation to the White House, as well as one to Facebook headquarters. This somehow prompted Sarah Palin to assert that she was the Queen of England. Here is another Real Thing that Happened: On September 7, 2008 Fannie Mae and Freddy Mac were put into federal conservatorship. One week later Lehman Brothers filed for bankruptcy, sending global financial markets into a tailspin. The resulting economic recession saw millions lose their homes and livelihoods. Here is a third Real Thing that Happened: On September 11, 2001, two planes crashed into the World Trade Center towers in Manhattan in what was revealed to be the first foreign attack on American soil since WWII. It was as if time itself had irreparably glitched — footage of the unthinkable events were looped over and over on televisions across the country, and by the time paroxysm finally calmed it was clear that history had shifted in character, modulated into a more sinister key. Each of these Real Things that Happened were enmeshed in a progression of events from which they appear inextricable. However absurd, unexpected, or implausible occurrences like these may be, once they happen there is a sense in which things couldn’t possibly have gone any other way. 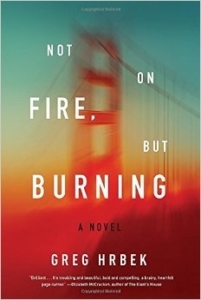 If I could only praise Greg Hrbek’s Not on Fire, but Burning one time, I would applaud its ability to make immediate and pressing a question that ordinarily feels naive and pointless: What if things had happened another way? Fortunately for me however, I am not limited to one single piece of praise. Hrbek’s exhilarating second novel is an inventive variation on a familiar trope of speculative fiction: parallel universes. It is difficult to prevent this perennial favorite generic convention from devolving into hollow navel-gazing — or else collapsing on itself entirely — but Hrbek brings the conceit to life, putting it to work not only as an engine to drive plot forward, but also as an thematic fusion device that allows him to bind the novel’s ethical concerns with its murky metaphysics. In prose that is swift and direct Hrbek is able to make some ponderous philosophical questions feel light as a head-rush. Not on Fire, but Burning tells the intertwining story of two boys as they struggle to navigate the dubious transition between childhood and maturity. Dorian Wakefield is a mostly-normal eleven-year old entering adolescence in a plausible version of what the suburbs of Albany, New York might look like in the near-ish future. The future world Dorian inhabits, it turns out, is not so radically different from our present one. There are still cul-de-sacs and bicycles, field trips, soccer games, and traffic jams, and children are still impulsive, cruel, insecure little mirrors of the adult world around them. The central counterfactual that distinguishes this world from our own involves an alternate-history version of the September 11 attacks. In this version of history the attacks took place in August instead of September, in San Francisco instead of New York, and took the form not of hijacked commercial airliners but instead some kind of flaming atomic missile that descended upon the twin towers of the Golden Gate Bridge. Nobody knows who perpetrated the 8/11 attacks, but American society is quick to blame the Muslim community, rounding up Muslims by the thousands and interning them in squalid camps in the depopulated region at the center of the North American continent. It was in one such camp the novel’s second protagonist Karim lost his own family to a drone strike. Orphaned in the Dakota Territory, Karim falls under the influence of a nefarious sheikh who promises that he will be reunited with his family if he martyrs himself in a suicide bombing when he escapes the camps. This promise of another world is all that he dreams about. Meanwhile Dorian has dreams so intense and vivid that he has become convinced that he has an older sister, a fact his parents steadfastly deny. Dorian’s mother doesn’t know whether to be more worried about her son’s delusions or the possibility that he will fall victim to the violent Islamophobia that has almost entirely eclipsed every other form of bigotry in this imagined future. When Dorian’s elderly neighbor adopts Karim and brings him back into Dorian’s suburban neighborhood, he unwittingly sets into motion a series of conflicts that require both children to wrestle with their histories, desires, and moral commitments. Hrbek’s characters are obsessed with counterfactuals — What if I had never moved? Never gotten an abortion? Been braver or more cowardly? When the story begins to accelerate faster and faster these questions grow white hot as they approach the impossible threshold between contemplation and action. Events unravel, a hole is ripped in the fabric of spacetime and realities from different possible worlds begin to have strange and uncanny effects on what transpires in “the present.” It becomes difficult to distinguish between reality and fantasy, whether that fantasy takes the form of misshapen memory, fantasy, theology, or dreams. As everything in their world comes apart, each boy must decide in his own way how to act, whether to succumb to the inevitability of his circumstances or to take a stand against the forces that seem to be pushing the history ever darker. When we are floating through the present moment, it often feels as though everything that happens is fluidly connected by an invisible causality that courses through it like a wave of light through the air. With hindsight we can sometimes see the photons, the individual choices that brought us to where we are now. Not on Fire, but Burning extends this metaphor into the ethical equivalent of Schrodinger’s Cat. In this book (as in the famous thought-experiment) mutually exclusive states of being are equally true at the same time. Karim’s parents are both dead and not-dead, Dorian’s sister is both real and not-real. We can imagine that our choices might resolve into any number of potential outcomes, but even if we had perfect knowledge of every outcome in every parallel timeline, there would still be a fundamental limit to what we can know about which choice to make now. Hrbek invites us to watch the state change that takes place when the box is opened and speculations are forced into the burning present. Eamon O’Connor is a writer and multimedia artist living in late-stage capitalism. Find him online at eamonabraham.com or follow him @condenastee.